Today’s episode of Investing in Real Estate is sponsored by Robinhood! Robinhood is an investing app that lets you buy and sell stocks, ETF’s, options, and cryptos- all commission-free. Robinhood is giving our listeners a FREE stock like Apple, Ford, or Sprint to help build your portfolio! Sign up at http://investing.robinhood.com. Wholesaling is a powerful way for real estate investors to get started, but it can be overwhelming if you don’t know what you’re doing. On today’s episode of Investing in Real Estate, Tom Krol is back to share more details about finding success in the world of wholesaling. This episode is full of gold—Tom is bringing tons of tips and strategies you can implement in order to identify properties, build trust with sellers, and turn a profit. 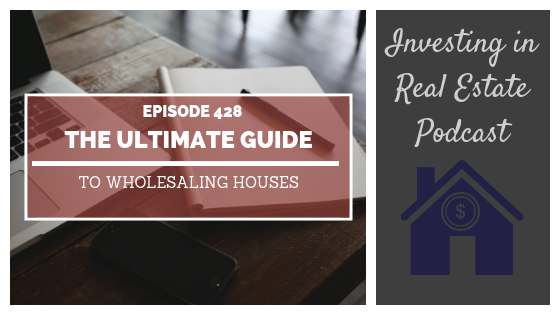 If you’ve ever been interested in making money through wholesaling houses, you won’t want to miss episode 428! The worst way to lose a motivated seller. The importance of getting a property under contract ASAP. How to get a property under contract. The importance of identifying why the seller is selling. How to identify an impending event.